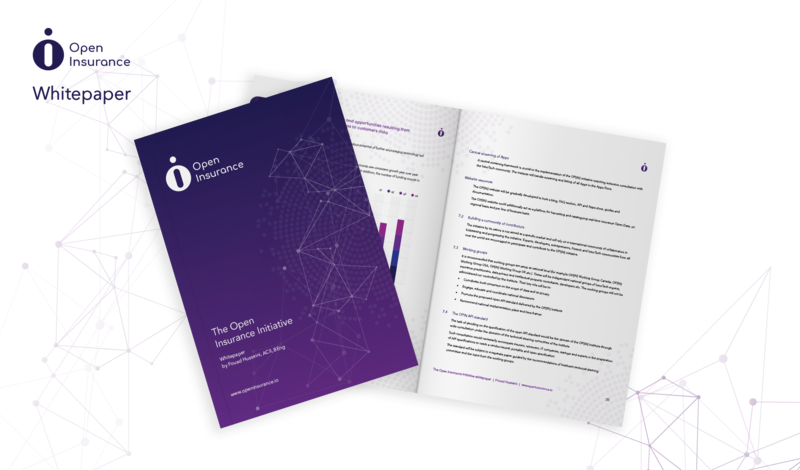 The Open Insurance initiative (OPIN) is a project aiming to drive transformational change in how personal customers interact with financial services. Fueling InsurTech growth and enabling developers to build awesome integrations with insurers APIs whose role is quickly evolving. Promoting the idea of free and open APIs in insurance and charting the path for the creation of a detailed framework for how an Open API Standard could be designed and delivered. Data is valuable to the consumer, to the companies that own it and to the firms that apply their technologies to it. We aim to provide the InsurTech community, developers and a multitude of third parties the capacity to securely integrate their applications with insurers data through open APIs. Insurers will more readily be able to experiment, collaborate and leverage innovative solutions and business models. The overarching emphasis of this initiative is the development of ever more sophisticated utilities providing customers with transformative experience through cheaper and highly accessible products. The white paper that introduced the concept of Open Insurance to the world! It provided an overview of the fundamental elements involved in insurers providing open access to their APIs. A study designed to define and clarify major elements of Open Insurance, open APIs, data security and privacy risks, intellectual property rights, data sharing and co-innovation. Coming soon!